This month we'll take a look at the new Leigh Box Joint & Beehive Jig. 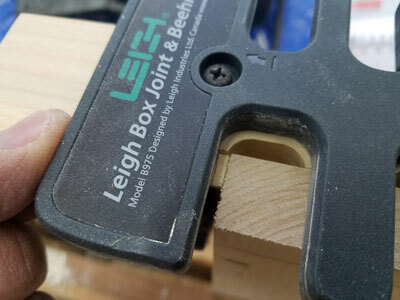 Since boxes are one of the first projects that woodworkers make, the box joint is one of the first joints that a woodworker might try. It is both aesthetically pleasing and extremely strong. 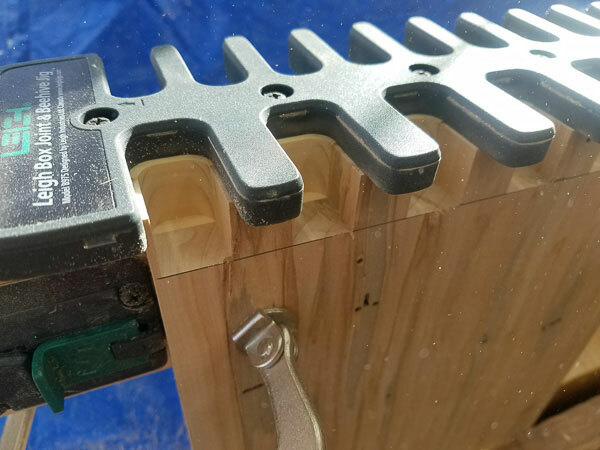 If you have ever made a box joint you have probably built a jig that looks a lot like the one below. 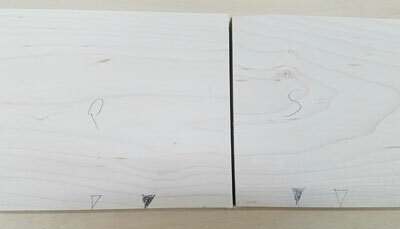 This is a typical 'step and repeat' jig made out of MDF and has a notch (dado) where the cut is made and a spacer block where the previous cut fits over to provide equal spacing across the board you are cutting. Although it looks straight forward to make, the actual setup is deceivingly hard and you need to make spacer blocks to get that first socket on the edge of the board just right. 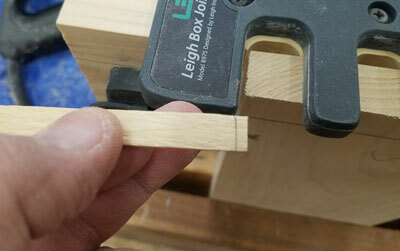 No matter how hard I've tried my box joints always seem either a little too tight or a little too loose or worse, the edge of the boards would not be flush. 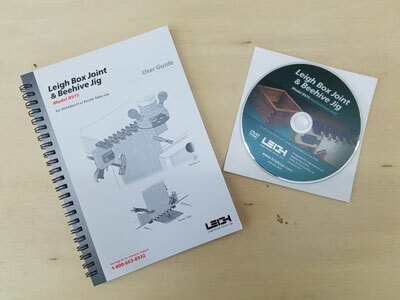 The new Leigh Box Joint Jig solves all of these problems! The jig provides a simple way to quickly make perfect 1/2" and 3/4" box joints using either a handheld router or a router mounted in a router table. The jig works on boards up to 13/16" thick and boards from 2" to 17-3/4" wide. 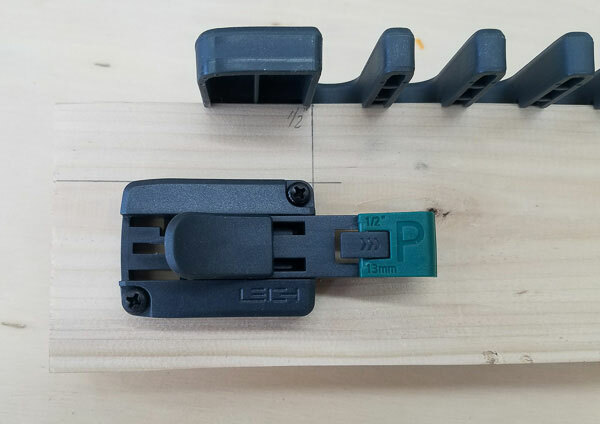 The heart of the system contains a glass-reinforced nylon template that has 'fingers' that guide the router, a patented e10 elliptical guide bushing and innovative adjustable side stops. The template fingers are spaced for 1/2" box joints on one side and for 3/4" box joints on the other side. 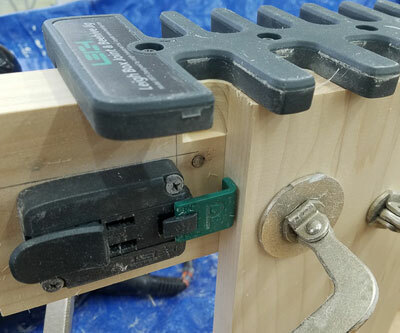 The e10 elliptical guide bushing is the same bushing as used on their Leigh RTJ400 Router Table Dovetail Jig, which I reviewed in the February 2016 issue of Wood News. Bushings are normally perfectly round but the e10's barrel is elliptical so that by rotating it slightly you can adjust the size of the dado that is cut. When the e10 is rotated, the effective diameter of the barrel changes, allowing fit adjustments as small as 0.001" (0.025mm). 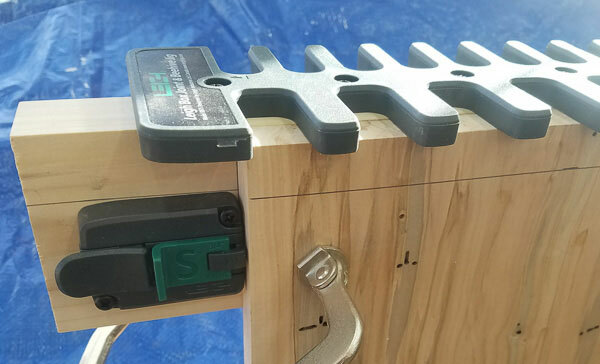 As with the Dovetail Jig, the e10 lets you 'dial-in' the perfect fit. The Beehive Jig also comes with a 1/2", 2 flute, carbide tipped straight bit. This is the only size bit that you can use in this jig. Finally, the jig comes with what I believe is the best user's guide and DVD on the market. Leigh makes exceptional user guides! It's 67 pages and very well illustrated with easy step- by-step instructions. The DVD takes you through a description of the jig, setup and how to use it. If you watch the DVD first the User Guide becomes just a reference manual because setting up the jig is very straight forward to do. 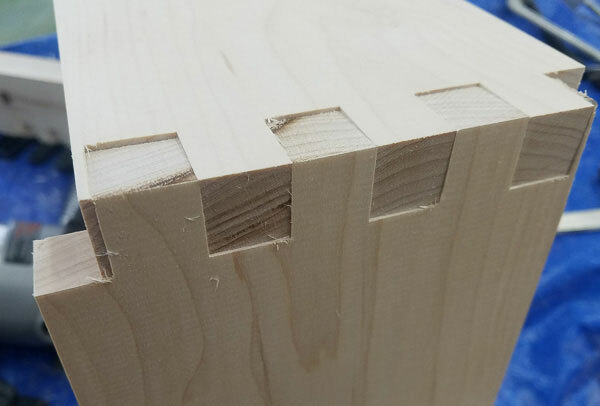 The first project I did was to create a perfectly fitted box joint. 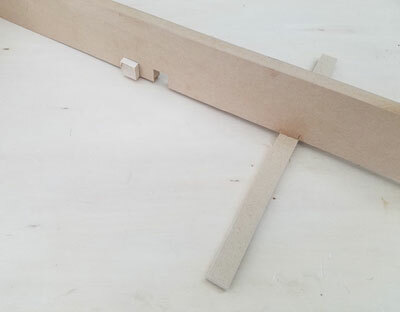 The first step is to mount the template and the adjustable side stops on a wooden beam. The beam can be made using MDF or a regular 2x4 that has had its edges made square. 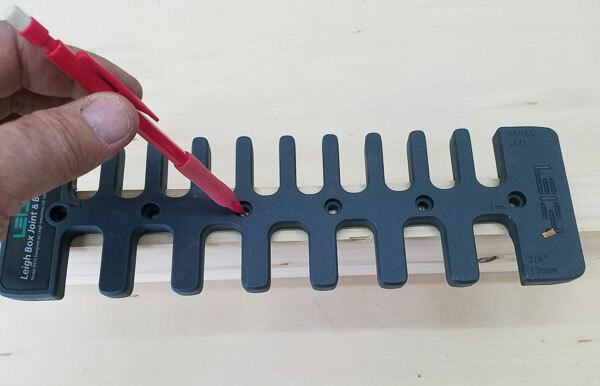 The template is placed on the beam and the mounting holes are marked. Reference lines are drawn for the side stops that are based on the location of the 1/2" and 3/4" template fingers. Once all the mounting hole locations are drawn and pilot holes drilled, everything is assembled using the included 1" Phillips head screws. This picture shows the template and side stop mounted and the side stop in the 'slot' position. 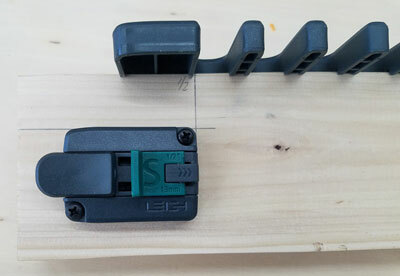 The green tab with an 'S' embossed on the side slides back and forth by releasing a thumb lock. This tab will be used as a stop for the edge of the board. 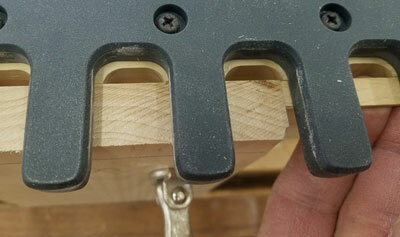 There is a 'slot' position for cutting the slots on the end of one board and, as in the following picture, a 'P' position for moving the board over to cut the pins. The last setup procedure is to mount the e10 elliptical bushing into the base of your router. 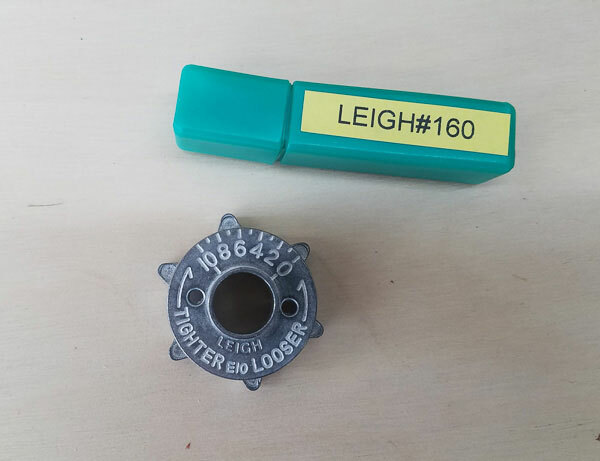 Once the bushing is mounted you make a small scratch mark on the base to use as an alignment mark for the numbers on the bushing. Here you can see I have made a scratch mark at the 12 o'clock position and then filled it in with a white pencil so it easily viewable. With the bushing at the zero mark, you are ready to use a scrap piece of wood to prepare the beam. 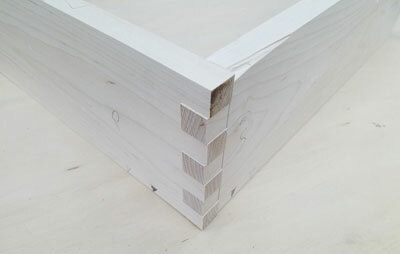 The beam holds your wood but also acts as a backer-board to prevent tear-out. You prepare the beam by making small indentations where future cuts will be made. This is shown in the following pictures. A scrap piece of wood is mounted in a vise and the jig is clamped to the board. An alignment mark is made 3/4" down to help set the depth of cut. The jig is now ready for use! The picture shows a very nice fit among the two boards. 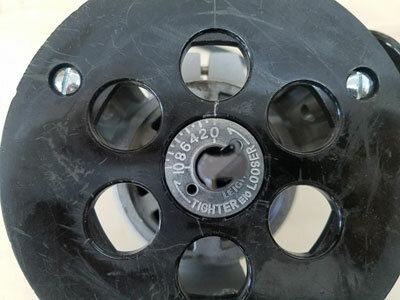 If they were too loose or too tight you would adjust the e10 bushing to a higher or lower number and repeat the cuts until you had a nice tight fit. My pins were a little short so I lowered the router bit and made the depth of cut a little deeper and the pins longer. You are now ready for your project boards. The user guide says to position the first board so the edges are evenly spaced between the first and last finger and move the adjustable stop over until it touches the board. I've always found it very hard to do this by eye or by getting a small ruler into place to measure the gap size between the edge of the board and the finger. Therefore, I have a little trick that I use to make this step very easy. 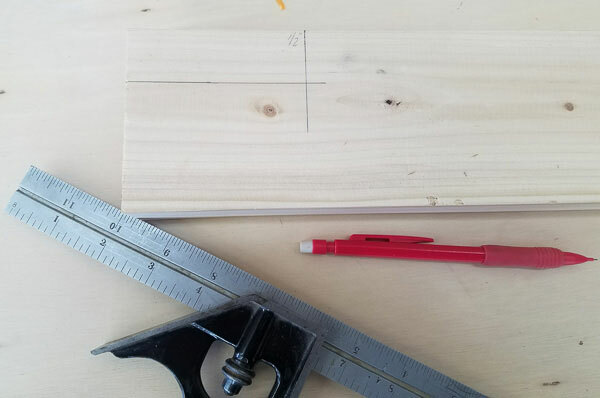 The pencil line is just barely visible which shows that the gaps on either side of the board are the same and therefore, the board is centered on the jig. 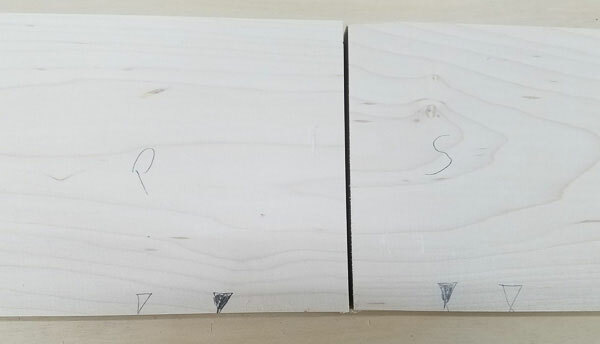 Now just mark up your boards so that you know which is the pin board and which is the slot board and you are ready to cut your box joints. Cut each board, remembering to put the same edge against the stops and to flip the pin and slot spacer tab between cuts and you should end up with a perfect joint! 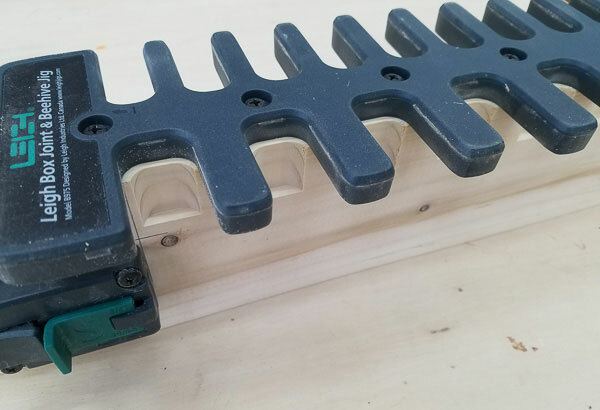 This jig is also called a beehive jig because this is the joint that is normally used to construct beehives. The jig was also designed to have a maximum cutting width that is the nominal height of a typical beehive. The Leigh Box Joint & Beehive Jig is the perfect jig for you to have in the shop to make box joint joinery. The only limitation is that the 1/2" bit size is the only size that you can use with the jig. Unless you are making very small boxes this size is a good compromise and has a very pleasing look. I highly recommend this jig and other products from Leigh Tools. 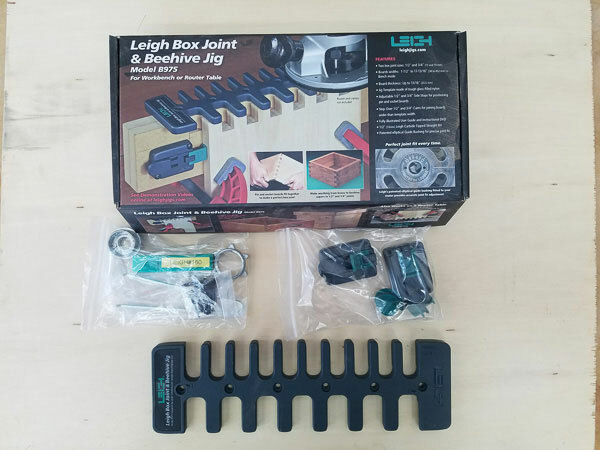 To find out more or to purchase a Leigh B975 Box Joint and Beehive Jig, visit the Highland Woodworking website.